At the Axiom Groupe Innovation Excellence 2017 conference, Rob de Graaf, Senior Consultant Product Innovation, provided a TED-like talk on the Golden triangle of corporate innovation: strategy, idea, and product. Compared to start-ups corporates have the advantage of strategy, where they can look at which developing needs to serve and therefore where best to innovate. 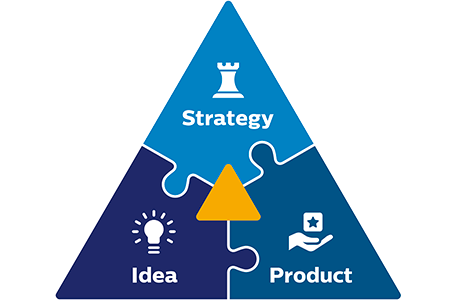 Based upon this iInnovation strategy, corporates should have a look at their portfolio and roadmap quarterly and subsequently identify the white spots where they need to start the ideation process. Many times these gaps can disrupt the market, this is especially true in the ongoing digital transformation. So it is key for the corporates to fill these gaps themselves. If an idea meets the FRITS criteria thresholds, developing a value proposition can start. The value proposition should clearly illustrate the offer, the customer benefits, and the business rationale to commit resources to product development and create value. Products can have any form, they may be goods, services, software, solutions, etcetera. Often these products are connected in the digital world as well. Corporates need to be able to integrate them with other products and define a spectrum of customer engagement models, to launch them in various markets successfully. After launch corporates need to start managing the product life cycle, which includes the managing the ecosystem, business model, customer engagement, and integration possibilities. The feedback the market provides on all these product life cycle aspects are fed back into the strategy to sharpen the view on the developing needs spaces in the market. To enable a corporate to be successful in innovation, one key prerequisite is to have a culture of innovation. A culture has strategies for breakfast, ideas for lunch and products for dinner. Corporates must ensure that their vision and values engage people inside and outside the organization to contribute. Innovation is not just a job for R&D, but for many more in and around the organization.